This holiday season, Clark Griswold vows his clan will enjoy "the most fun-filled, old-fashioned, family Christmas ever." Before you can sing "Fa-la-la-la-lah," he decks the halls with howls of folly in the perennial favorite, National Lampoon's Christmas Vacation. First we saw the Griswold family go on a cross-country US trip with disastrous results. Next they took on Europe and encountered similarly nutty problems. With the series’ third installment, we watch the Griswolds celebrate the holiday season in National Lampoon’s Christmas Vacation. Why do I have a sneaking suspicion that some wacky predicaments will ensue? Unlike the first two flicks, Christmas doesn’t involve a journey. The Griswolds – Clark (Chevy Chase), Ellen (Beverly D’Angelo), Audrey (Juliette Lewis) and Rusty (Johnny Galecki) - stay home and the fun comes to them. After a rough trip to secure their tree – they return with a ridiculously enormous one – they anticipate the arrival of many relatives. They’ll host both his parents (John Randolph and Diane Ladd) and hers (E.G. Marshall and Doris Roberts). The two pairs don’t much care for each other, which causes friction. Since Ellen’s parents also disapprove of him, other problems develop. While Clark tries to create the ideal Christmas via elements like an over-the-top lawn ornament and light display, he deals with the family tensions and aggravations caused by his antagonistic yuppie neighbors Todd and Margo Chester (Nicholas Guest and Julia Louis-Dreyfus). Matters complicate further with the unexpected – and unwelcome – arrival of Ellen’s cousin Eddie (Randy Quaid) and his brood. The final straw occurs when Clark’s boss Mr. Shirley (Brian Doyle-Murray) doesn’t issue the expected Christmas bonus, which helps set off our hero. From what I understand, Christmas Vacation maintains a pretty decent fanbase. Frankly, I can’t see why this lame excuse for a holiday flick gets much positive attention. It seems lackluster at best and pointless at worst. Without question, the film enjoys a slew of situations that could develop into humorous episodes. The whole issue of the visiting relatives along with house decorating, tree hunting, and other staples of the season lend themselves easily to comedy. Most of us know what those occasions are like and can relate to them, which sets up the gags well. Unfortunately, Christmas never remotely capitalizes on all of that. Instead, it uses all these situations as little more than chances to toss out trite and predictable slapstick. Few occasions for physical humor pass without an appearance of someone falling or hurting themselves. That seems to be the filmmakers’ answer to every potentially funny set-up: bring on the pain and the laughs will follow. The amusement almost never ensues, though. Instead, the gags just fall flat and leave us without much satisfaction. No spark or pizzazz accompanies the development of the jokes or situations here. The film simply meanders along a loose plot structure, flings out gags at random and hopes the hit the mark. They don’t. The film makes a number of other misfires. For the life of me, I can’t figure out why they added the yuppie neighbors other than just because people hate smug characters like them. They offer an easy target and let us see Clark inflict harm on someone other than himself and his family for once. That’s not a great reason to include them, and their moments add nothing to the film. Clark himself seems noticeably different in Christmas. For the most part, we lose the manic personality of the earlier movies, as this Clark comes across as surlier and meaner. In the film’s first scene, he enacts some serious road rage, and other moments early in the flick demonstrate similar nastiness. This character really should remain naïve and benign until he becomes so heavily provoked he can’t take it anymore, but the Clark of Christmas starts with a bad attitude. The movie tries to mellow him somewhat as it progresses, but that seems like an odd way to go considering our already-established familiarity with him. Add to that a climax that does little more than replicate the ending of the original movie and Christmas Vacation feels like a tired enterprise. The film fails to explore many open doors and can’t think of anything better to do than injure characters to attempt to garner laughs. The movie falls flat the vast majority of the time and goes nowhere. 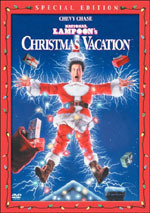 National Lampoon’s Christmas Vacation appears in an aspect ratio of approximately 1.85:1 on this single-sided, single-layered DVD; the image has been enhanced for 16X9 televisions. 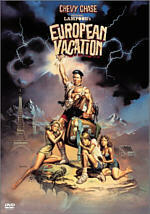 The first two Vacation flicks provided surprisingly solid visual presentations, and Christmas proved to be no exception to that rule. The movie consistently looked nicely crisp and well defined. I noticed no issues connected to softness at any time. Instead, the flick stayed distinct and detailed. Jagged edges and moiré effects caused no concerns, and only a little minor edge enhancement manifested itself at times. Print flaws remained very modest. Some light grain appeared, and I also noticed the occasional speck or bit of grit, but these were rare intrusions. Colors never quite excelled, but they seemed above average. The movie stuck with a largely accurate and natural palette that consistently seemed clean and concise. The hues didn’t stand out as terrific, but they were very satisfying. Black levels looked quite deep and rich, while shadows seemed especially well developed. Comedies from the Eighties often suffered from a drab look that often affected those elements, but they worked nicely here. At not time did Christmas Vacation turn into a superior transfer, but it was decidedly better than most flicks of this genre and era. After two straight mono movies, Christmas Vacation finally expanded to Dolby Surround 2.0. However, don’t expect a great deal from this mix, as it seemed good but not special. Unsurprisingly, most of the audio emanated from the front speakers. Some decent use of directional dialogue occurred, and elements moved effectively from one channel to another. The score presented somewhat mushy stereo imaging at times. The music wasn’t monaural, but the score didn’t seem terribly well differentiated across the front. Effects mostly focused on general ambience, though they came to life moderately during some of the flick’s big slapstick scenes. The same held true for the surrounds. Those played a small role in the proceedings and became active only briefly during a few comedic pieces. Audio quality showed its age but seemed satisfactory overall. Speech demonstrated a little edginess at times but usually appeared reasonably natural and distinctive, and I discerned no concerns connected to intelligibility. Music sounded a bit mushy but range appeared fairly solid and general clarity was usually fine. Effects made the most use of the subwoofer, as some of the big slapstick bits kicked in pretty good bass. Otherwise, those elements appeared acceptably accurate but not tremendously well reproduced. Ultimately, the soundtrack of Christmas Vacation lacked anything to make it stand out, but it worked fine for a film of this genre and this vintage. Christmas Vacation doesn’t provide many extras, but we do find one substantial one. In addition to the film’s theatrical trailer, we get an audio commentary from actors Beverly D’Angelo, Randy Quaid, Miriam Flynn, and Johnny Galecki plus director Jeremiah Chechik and producer Matty Simmons. All six of them sit together for their running, screen-specific track. Putting all of them in one place gives their chat a nicely rollicking and lively tone, but it doesn’t mean we learn much about the movie. The actors toss in occasional insights about their characters – mostly as D’Angelo relates struggles related to her hair – and Chechik adds the greatest level of detail via some production anecdotes. 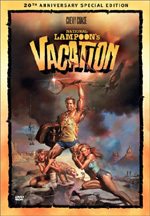 D’Angelo also gives us the most tantalizing teaser when she states that at the start of each Vacation flick, she and Chevy Chase love each other, but they come to hate each other by the end of production. Unfortunately, she doesn’t expand on this nugget. Mostly the participants watch the movie and laugh; that tendency becomes especially heavy during the film’s second half, and gaps become more substantial during that period as well. The track remains moderately entertaining, mostly because the folks seem to enjoy themselves, but you won’t learn much about the production. I don’t think Christmas Vacation offers the worst holiday movie I’ve seen, but it seems pretty blah nonetheless. It just rehashes the same old formula and doesn’t do anything particularly amusing or noteworthy. The DVD presents very good picture with reasonably strong sound but it skimps on extras. 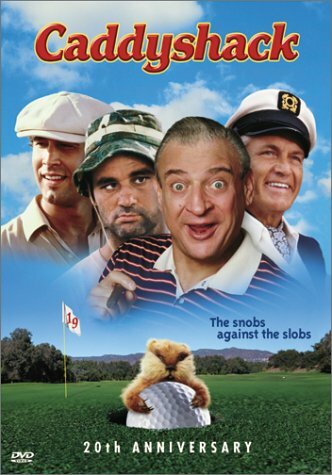 Other than a mediocre commentary, we get virtually no extras. The film’s apparently extensive roster of fans should feel happy with the DVD, but I can’t recommend this dull movie to others.